Reliable and accurate white liquor analysis for batch and continuous digesters is important for minimizing pulp quality variations. 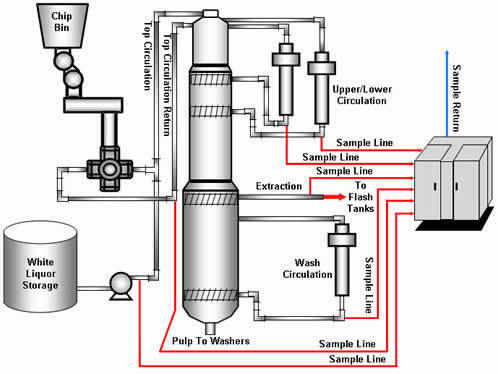 For both continuous and batch digesters, white liquor composition needs to be accurately known to ensure that the correct effective alkali is charged for the given chip mass entering the digester. Yet variations can occur that interfere with charging the correct amount of alkali on wood for batch and continuous digesters. The two primary sources of these interference are chip moisture variations and white liquor variations. If white liquor composition is accurately known then one source of variation can be eliminated. With an online white liquor analyzer the white liquor can be trimmed in real-time to meet target effective alkali and sulfidity levels. Maintaining these levels allows the mill to maintain a constant liquor to wood (L/W) ratio for a given alkali to wood ratio. Alternatively, variations in alkali to wood ratio induced by white liquor composition variations can be compensated for by only adjusting the liquor to wood ratio. Either approach requires an accurate online analysis of the cooking white liquor. The DURALYZER-NIR white liquor analyzer provides the required effective alkali (EA) and sulfidity measurements in a timely, accurate and reliable manner. Additionally, white liquor TTA, TDS and deadload levels are also available from the same analyzer. The Continuous Digester Liquor Analyzer Solution is a turnkey solution for carrying out white and black liquor analysis of the digester. The system is based on industrial spectrometer. The analyzer is designed to extract samples from a continuous digester at strategic locations. Black liquor analysis includes Residual Effective Alkali (REA), RAA, TDO(Total Dissolved Organics) and Total Dissolved Solids (TDS). While, white liquor analysis provides measurements for effective alkali (EA), AA, TTA, sodium sulfide (Na2S), sodium carbonate (Na2CO3) and total Dissolved solids (TDS). The analyzer package consists of an industrial spectrometer configured for white & black liquor analysis, an acid cleaning system to remove scale buildup from the sampling optics and all the necessary sampling hardware to interface white & black liquor lines into the system. 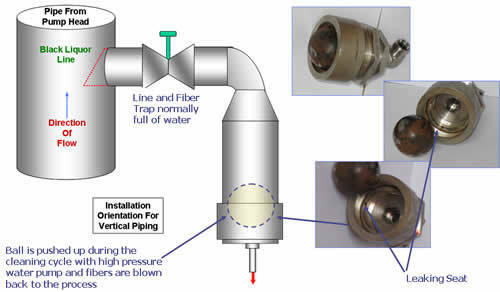 The liquor sample points are brought into the system with ½” stainless steel tubing or equivalent. Sampling and cleaning is completely automated and is controlled by the spectrometer and sampling system microcontroller.